I've put up 23 YouTube videos. At times I look at the anemic view counts and wonder why it's hard to get my videographer genius recognized. This news post from the Onion News Network puts it all in perspective. A video story of a lost love with some great dance moves. All of us who sail have, at one time or another, experienced foils that, at speed, hum or sing. I never had a singing foil that affected my day out pleasure boating. But VOR leaders Ericsson 4 have a rudder that day in, day out, 24/7, just shrieked. Would this be equivalent of hearing nails on a blackboard 24/7? Stig Westergaard is a watch leader on Team Russia. Vendee Globe, the singlehanded around the world race, is now underway. The leaders are approaching the bottom of Africa. The Vendee Globe doesn't get much play in the United States; I guess mainly because it is mostly a French affair (out of 30 starters, eight were English, 1 was American, sounds like one of them may be Polish .... the rest French). A pity it doesn't get more press over on this side of the Atlantic. The Vendee Globe must be the most grueling of any of the endurance sports and I include the Tour de France here. The leaders are expected to take 90 days to get around and most of them seem to be on 2-3 hour sleep cycles as they constantly drive their boats. The Open 60 designs are beasts; 60 footers with clouds of sail though at least they pay some heed to shielding the crew from the worst with large steering cuddies (unlike the VOR 70's). Unfortunately most of the interviews are in French, a language I found beautifully melodic but incomprehensible. Reminds me of the tired joke. 1. What do you call a person that speaks more than two languages ..... multilingual. 2. What do you call a person that speaks two languages .... bilingual. 3. What do you call a person that speaks one language ..... American. Cowes TV did an English interview with French sailor Seb Josse sailing for BT. You get a good feel for these Open 60's. Of note is the central channel which leads all the lines aft to the steering pod for easier and protected handling of sails. Seb Josse is currently lying second. I'm a sucker for homebuilt wooden sailing dinghies. This video popped up this weekend and shows some Swedish only wooden classics, mostly single chine plywood designs. 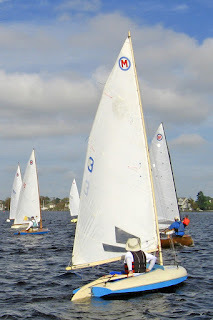 Some classes I recognize, such as the junior A kanot (canoe stern, first boat shown in the video) and the B kanot (canoe stern, the one with the mini hiking wings). I have no idea what class of boat sports the balanced jib boom or the class sporting the single trapeze. The Google translation from Swedish says this is a sailing camp. I assume it is somewhere in the Stockholm archipeligo. 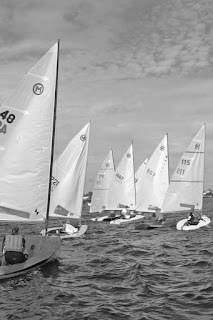 All these junior sailors and not one fiberglass Opti to be seen! Nils Björkman in Sweden has a whole slew of youth boats. He is a Naval Architect and runs Ungdomarnas Båtbygge (The youth boat building club). A webpage of Nils Björkman designs. YouTube is the new MTV. So every Friday I will attempt to feature my eclectic musical tastes. Canadian singer Feist's song 1234 is a poppy, bouncy, tune with a good looking female singer and some very weird dance moves. Sorry, the original version went away. All we have is the Sesame Street version (words modified). Team Russia, a Rob Humphries design Volvo 70. Reference my comment .... one day, one wave train you will get it wrong. The video is a little bit discombobulated, but viewing it with some offshore sailors, here is how they dissect it. - Boat piles up on a wave, slows and then broaches. - Involuntary gybe and now the canting keel is on the wrong side. - Boat can't right itself, so it stops in the vertical position until they can get the canting keel pumped around. - Afterguard climbs to weather using whatever handholds they can find. - Keel gets wound around and boat slowly rights itself. Offwatch scrambles on deck. We have video from the inside of the boat as the poor offwatch also have to contend with a now vertical floor. From the .... I'm glad I'm on this end looking in. 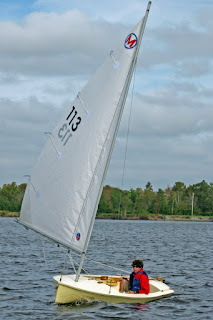 Certainly over my years sailboat racing, I have, on occasion, been very good at working my way to the back of the fleet. Now with the proliferation of onboard cameras, we have the luxury of watching others also making big tactical booboos and putting it online for all to see. From the onboard camera aboard an Ultimate 20 during one of their races at the East Coast Championships at Lake Norman, North Carolina. Certainly our Ultimate 20 team looks to have a good start near the weather end but at the 2.33 mark, when going right, the skipper inexplicably tacks into the wind shadow of a starboard tacker. Another quick clearing tack and then they dig themselves out to the right side all by their very lonesome. Part of the problem is they are only two crew when it looks like most of the other U20's have at least three. So they may be overpowered but the crew only hikes off the start line and then perches inboard for most of the rest of the first beat. They certainly seem to be enjoying the race and the crew is certainly adept at getting all the jobs done, even though they are shorthanded. Gotta have fun and these two definitely seem to be doing that. From the Puma Team. Underneath all the bravado talk, you get a sense of the stress of racing these boats. I think Jerry Kirby was another oldster that took a break from racing the Cochin India leg. 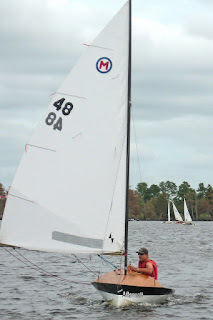 From the YouTube Universe; Melges 24 smackdown! From YouTuber "rapidecharly", a Melges 24 blasting downwind seemingly under control untli they attempt a gybe at the 1 minute 22 second mark. A slideshow about the 2007 Classic Moth Midwinters was my second YouTube video. I've gotten better at using Adobe Elements and figured out how to add music. Music was by a local Baltimore/Washington ska band "The Players". I twice saw them perform live. Great band. Pictures were taken by Amy Linton. 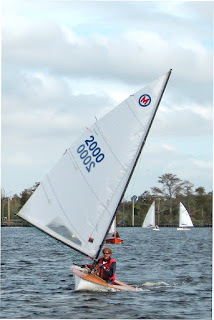 The 2007 Midwinters was the first one to be held at Gulfport YC, St. Petersburg FL. and featured good breezes on Saturday (around 20 knots) and much lighter on Sunday (around 5 knots). For those who wonder why all the hulls look different it's because the class is a development class where you design within a box rule (11' LOA, 5' Beam, 75 lbs. hull weight and a max 1" hollows restriction on hull shape aft of the Daggerboard trunk to prevent wings or catamarans). There are also close up shots of brothers, Mark and Craig Saunders as well as Derek Dudinsky. I've put 23 YouTube videos out there and I've thought that one way to utilize this blog is to provide commentary on some my YouTube videos, just like the Directors Cut in the DVD's you rent. The first YouTube video I did was in December 2007; a slide show of photos from the 2007 Mid Atlantic Small Craft Festival in St. Michaels. I used Adobe Photo Elements Slideshow Creator to string together some digital photos. I didn't know enough to add music, so this is a silent video. One interesting craft was an Adirondack Guideboat built out of paper shown at 32 seconds in. Building small craft out of glued up paper was a popular way of building small canoes in the early 1900's. I talked to the builder and he admitted it was very time consuming way to build and used a fair bit of resin. 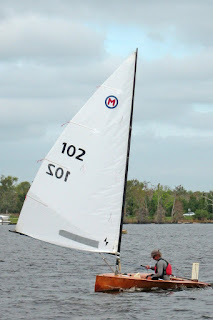 My Classic Moth is featured going out to the sailing race on Saturday. 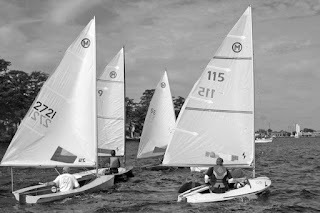 They usually get around 60 boats of all types and sizes, with very few having any knowledge of racing rules, the starts are usually one of avoidance and trying to dig yourself out to one side of the course. The end of the video shows three people showing geat interest (puzzlement) in some rigging on my Classic Moth. I've been watching the videos of this race both on YouTube and from their website www.volvooceanrace.org/multimedia/video-gallery/ and I get the feeling of watching a car wreck slowly unfolding. 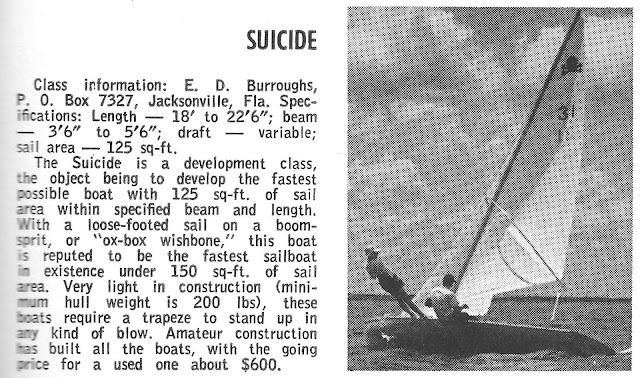 These boats are brutal. I mean brutal!!! At speed (over 20 knots) on deck, the boat is underwater. On watch means constant firehose spray .... there is nowhere to hide. Imagine steering a boat doing mid 20's in the pitch black. Insane!! and these guys do it day in and day out. The law of averages says there will be one day ... one wave train where you get it wrong. The wind gets up to 40 knots and the boats look to be under control 95% of the time but the other 5% is utter mayhem. Puma reports that at one hour they pitchpole so violently that they break the prodder and shred the foresail. The next hour they launch off a wave and crack the center frame up at the bow. And this is one of the best prepared campaigns of the bunch. One telling video interview had Jonathon McKee working the grinder and saying that after three days of putting the pedal down going to Capetown he was looking for a respite. At Capetown he was cycled off the boat for the next leg. His 50 year old body needed some R&R. I have the utmost respect for Jonathon's sailing abilities but these boats chew up sailors and spit them out. I really wonder how many of these teams will be able to complete that monster leg between Quindao, China and Rio De Janeiro Brazil? John Keegan, the military historian, wrote a book "The Face of War" where he speculated on how a full military confrontation between the East and West on the border of Germany would play out (obviously written before the downfall of the Eastern Bloc). His conclusion; after three days of all out tank battles, ground battles; for those on the front line, the human body would shut down. I really wonder if, with these latest Volvo 70's, they have upped the game so much, that we will have human zombies trying to finish this thing out. I've created this blog mainly as a response to another writing assignment from blogger Tillerman. www.propercourse.blogspot.comThere may be other uses for this blog but for right now lets dig into Tillerman's assignment .... who would you invite to a very special dinner/party? For this party you can get to mix the living and the dead, the friends and the strangers. You must start with your COF - Circle of Friends, boffins which in this case would be Bill Beaver, John Z, George Saunders, Steve Clark, John Kells, Bob Ames, Bob Blomquist, Paul Miller with some left coast COF boffins such as Erich Chase, Del Olsen, Fran DeFaymoreau (4 Naval Architects in this group and everyone has built, in most cases, multiple racing dinghies). I would also add local acquaintance, Aussie Tony Arends. I'd also invite boffin Bill Boyle but he doesn't seem to do parties very well. Ben Lexcen - i.e. Bob Miller - Australia deceased - Top designer/sailor in the Australian 18 skiffs. 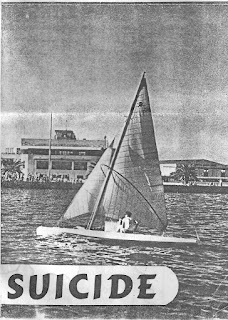 Designed the Contender which won the IYRU singlehanded trials in the early 1960's. Designed the wing keeled Australia II that wrested the America's Cup from the Americans. From everything I read, Ben Lexcen was a larger than life character and you need some of those at a party. Here is a video of Ben Lexcen's 18-footer design, Taipan.